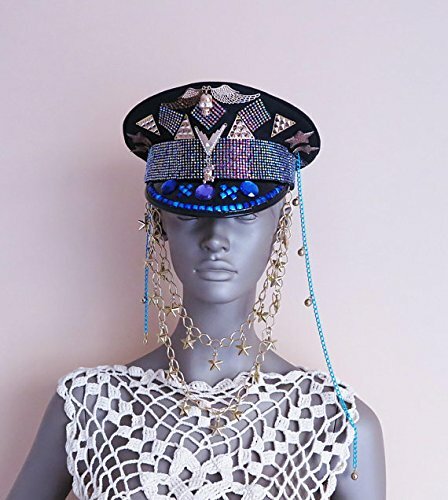 ☆A glamorous, unique, unisex, hand sewn military hat. ☆Perfect accessory for Burning Man, EDC, Glastonbury, Coachella and all festivals! ♫ ┌༼ຈل͜ຈ༽┘ ♪ ☆One of a kind. (AND THERE IS ONLY ONE!) ☆Meticulously handmade with ♡ in Istanbul. [^._.^]ﾉ彡 ☆Ready to ship. ☆New bling ooak hats will be coming soon. ƪ(˘⌣˘)ʃ DETAILS: Measure from your forehead about an inch above your eyebrows around the back of your head above your ears. If you have any questions or concern regarding sizing, feel free to message us. If you have any questions about this product by April Delouvre, contact us by completing and submitting the form below. If you are looking for a specif part number, please include it with your message.